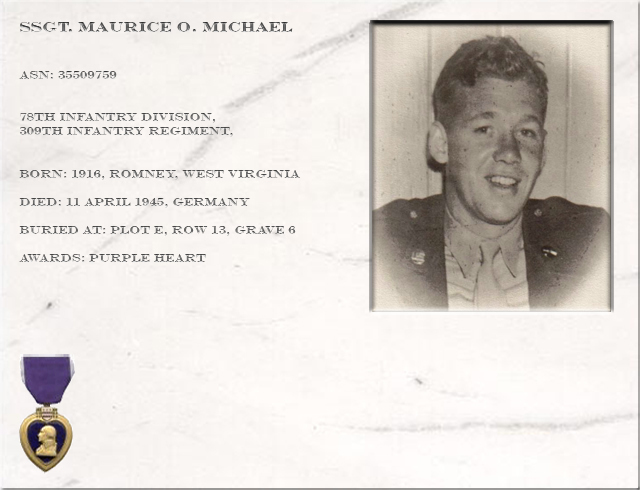 Maurice Otho Michael from Romney, Hampshire County, West Virginia was 29 years old (1945). 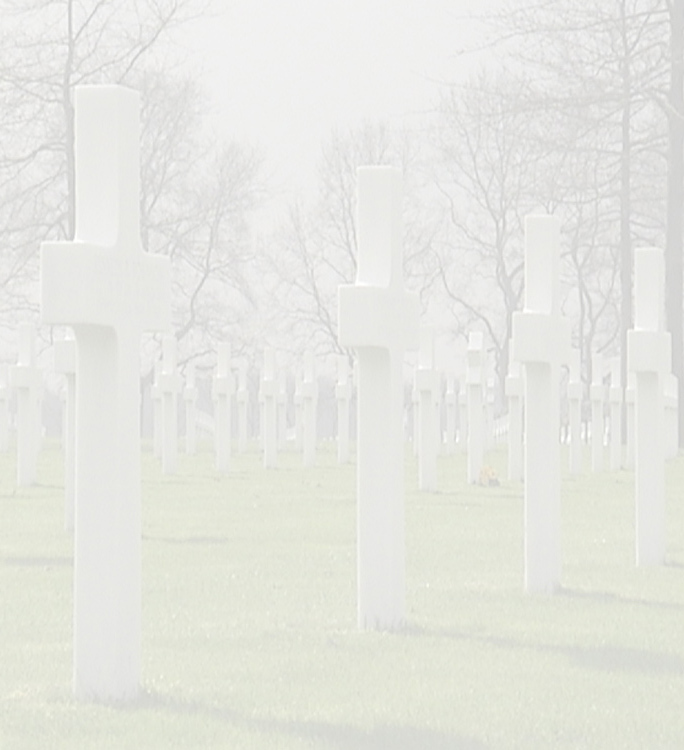 His family consisted of father Carl, his mother, 2 brothers (both in service of their country) and 4 sisters. Before entering the army on september 19, 1942 he had worked with the Coffman Fisher Company for 9 years. He received his basic-training at Fort McClellan in Alabama. After basic-training he was stationed at Camp Butner, North Carolina with the 78th Infantry Division (Lightning Division), then a training Division. Here he got further training and was an instructor on the firing-range. When the 78th Division had to prepare for fighting itself, he became a member of the Anti-tank unit of the 309th Infantry Regiment. 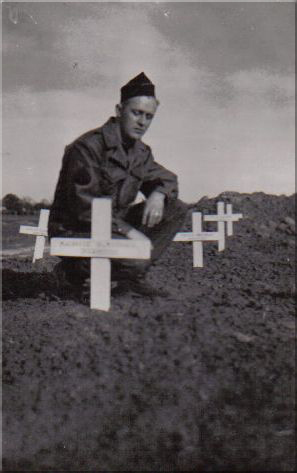 In early October 1944 he left with his unit for Europe. The 78th Infantry Division, "Lightning division" was established on the 27th of august 1917 in Camp Dix, NJ. After 9 months of training the division was transported to France in May 1918. Here they fought in the Meuse-Argonne offensive that marked the end of the first world war. In this offensive it was the spearhead division. After WW1 the Lightning division was de-activated. On the 15th of August 1942 the 78th division was needed again to serve it's country. The division was activated in Camp Butner, NC. At first it was a training division, delivering over 60000 well trained soldiers to other divisions. From April 1944 the 78th division itself was preparing for combat. Early October they stayed a week in Camp Kilmer, from where they were shipped to Europe. After a stay in England the division went to France on 22 november 1944. It took a couple of days to reorganise before going to Belgium by box-car. On December 13th 1944 the Lightning division first saw combat at the battle for Hürtgenforrest. Later it fought in the battle of the Bulge, again Hürtgenforrest, Siegfriedline, Rurh, Rhine (Remagen) and the Rurh-pocket. After VE-day the 78th division stayed in Europe as an occupation force until the 22nd of May 1946. After WW2 the division was active as a training division and it saw combat again during operation Desert Storm. Central-Europe: On April 1, 1945 after the succesfull crossing of the Rhine on several places, elements of the 9th Army (from the North) and the 1st Army (from the South) closed the Ruhr-area. Capturing the entire German "Armee Gruppe B" in the Ruhr-pocket. Now the Allied forces began mopping up the pocket from all directions eventually destroying the complete "Armee Gruppe B". The 78th Division attacked the Ruhr-pocket from Remagen (South-West) where they crossed the Rhine as first Infantry Division on March 8. ". . . In eleven days you advanced more than 50 miles against the enemy. You captured 47,581 prisoners, including 7 General Officers. You captured some 120 towns and villages. You cleared over 300 square miles of enemy territory... The courage, fighting heart, and aggressive spirit which broke the Seigfried Line, wrested Schwammenauel Dam from the enemy, and secured the now famous Remagen bridgehead, are still with you." The Ruhr-pocket is also known as the Rose-pocket, named after Major-General Maurice Rose. 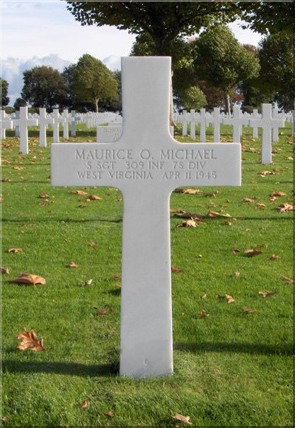 On the 11th of April SSgt Maurice Michael was seriously wounded in battle, He died later that day. On May 5th his family was informed about his death. 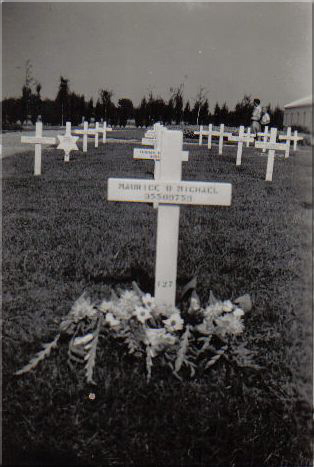 Grave of Maurice Michael at the Margraten cemetery in probably 1946.